In a breakthrough new service, prison inmates here will be able to use money transfer services in jail, to both send and receive money within and outside the country. This was announced as part of the Dubai Police's new Artificial Intelligence (AI) systems and programs, reviewed by Major-General Abdullah Khalifa Al Marri, Commander-in-Chief of the Dubai Police. Many of these projects are designed to take the Dubai Police Strategy forward, in line with the Dubai 10X initiative that seeks to position all of the emirate's entities 10 years ahead of the rest of the world in all sectors, therefore propelling it into the future. 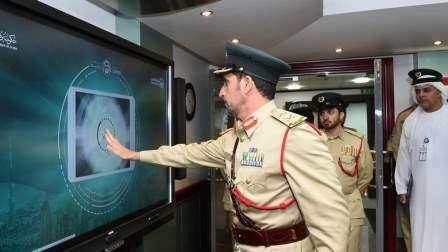 During an annual inspection of the General Department of Artificial Intelligence, Maj-Gen Al Marri reviewed some of the projects, including one that facilitates passenger payments through Interactive Voice Response (IVR), which will be linked to the non-emergency police number 901, to make payments. The IVR will allow people to pay their fines and debts at the airport, letting them travel out of the country without impediment in case they have pending payments. Another revolutionary development is the use of a drone called 'Zephyr', a High Altitude Pseudo Satellite (Haps). Produced by Airbus, it runs on solar power and fills the capability gap between a satellite and UAVs (unmanned aerial vehicles), reaching heights up to 65,000 feet and thus going beyond the scope of civil aviation. It can be used to take photos and record live videos round the clock. The Dubai Police chief also reviewed a new invention, a smart military suit that enable policement to carry out their duties in all circumstances, in addition to a self-driving motorcycle and a hover bike. He also identified a range of future services that will be offered by the AI department. A particularly noteworthy service is the new money transfer service available to prisoners. Inmates of the General Department of Penal and Correctional Institutions, who fall under certain categories can now send and receive money via transfer, which can be made both inside and out of the country. Maj-Gen Al Marri also reviewed a new electronic messaging system and a volunteer initiatives website for Dubai Police employees, which will feature a volunteer management competition. A new package of programmes will also be added to the Dubai Smart Police Centre (SPC), such as 'Parachute' and 'Free Drawing Programme', besides others aiding sign language, helping fight human trafficking and a new information security system. A new electrical line of the main data centre will reduce power use and keep the centre running smoothly. As part of the Dubai 10X initiative, Maj-Gen Al Marri was briefed on the Smart Interview Program and chat bots, which will be used to reply to customer' queries and enquiries on their platforms. Other innovations include a robot designed to service clients, Smart Security Patrol System, Virtual Smartphone Plugin, Smart Hand Clock for Emergency Situations, and 3D Printer Model. There is also an AI Clinic and a new electric vehicle to provide technical support, reduce energy consumption and carbon emissions, thus maintaining sustainability. The number of communications received by the police via the iOS and Android app, through the service of 'We are all police' reached 20,367 messages in the last year. The service was launched to reduce traffic violations and reckless driving in Dubai. Another service, the 'Eye of the Police', aimed to security and crime reduction, received 14,904 reports last year, including 13,904 reports through the Dubai Police smart app and 403 via the website.